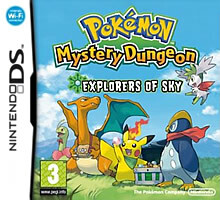 Note: Copy any of the above Pokémon Mystery Dungeon: Explorers of Sky (Europe) rom download links and paste it into your browser to download. They do work you idiot! My Mac will not expand the RAR file, please help. Mega Upload: Unfortunately, the link you have clicked is not available. - The file has been deleted because it was violating our Terms of service. Freak Share tells us to register, pay and then download! Do you have free download links for this game? BTW...Do you have links for Pokemon Ranger 3: Locus of Light(U)?